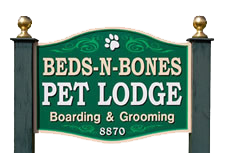 Welcome to Beds-N-Bones.com, our new home on the Internet! We are located just minutes west of the city of Batavia. Spend time traveling worry-free while your pets stay in our state-of-the-art pet lodge. Our facility is extremely clean and secure. We offer air conditioning, radiant heated floors, monitored fire alarm, spacious indoor and covered outdoor runs, exercise play yards, soothing music for the relaxation of your pet – all of this in a country setting. Please keep us in mind the next time you are heading out of town. Call for a tour or to make a reservation.